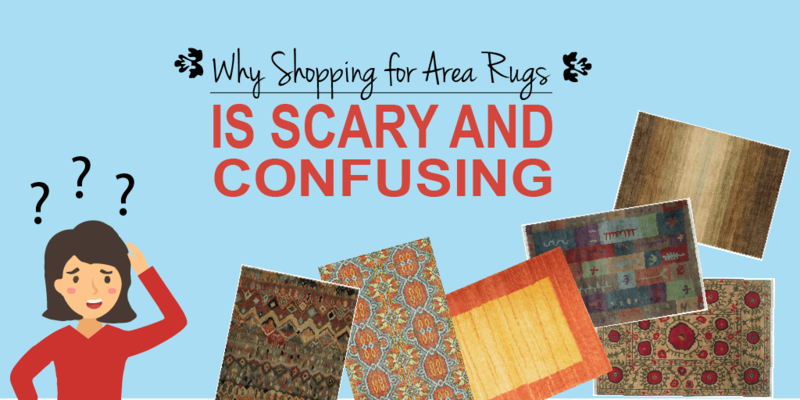 Why Shopping for Area Rugs is confusing …… and scary. The Oriental rug business, much like the used car industry has been maligned due to the shady sales practices of a few bad dealers who advertise “SALE!! !” and “ and “70% OFF!! !.” That’s why we’ve outlined how you can safely purchase a quality area rug. Everyone has heard an account about getting ripped off on a rug purchase. They were sold a “hand-made” rug that was really “hand-tufted.” They were told that a rug was an antique when in fact it was made in the 1970’s. They were sold a “Silk” rug that is actually mercerized cotton, etc. In many ways, the area rug industry has trained consumers to be afraid of the buying process. Friends ask if they should study knot-count, country of origin or dye composition before going to look at rugs. “How do I know that I’m getting what I pay for?” they ask. I’ve never heard people ask such questions about sheets and towels and sofas. Try to locate a reputable dealer who has a showroom where you can actually see color and feel material. Online shopping is a good way to get an idea of the thousands of designs available in the market but despite the convenience of examining 100 items on your desktop in 10 minutes, the number one comment we hear from customers is that “the colors look completely different than what I saw online.” Synthetic materials and inferior wool also shows well online but looks and performs completely differently on the floor. Choosing the perfect area rug takes time, but you can do it. Convenience aside, rugs are definitely a product that you really should see in person. Mass-market budget stores also do not sell high-quality rugs. Real rugs take time to produce and this simply does not fit the bulk-purchasing model. If you look in Home Depot, Lowes or Costco, you simply won’t find quality rugs. Stores who are perpetually “Going Out Of Business” should also be avoided. This is where flawed merchandise is stockpiled and you probably won’t know what’s wrong with the rug until weeks or even years after you buy it. If you have looked around and are still not comfortable, try asking your local rug cleaner. By doing this, you will get an objective opinion about who has been in business the longest, sells the highest quality and has a solid reputation. Hiring an Interior Designer is also an option. Price is determined by Size, Materials, and Construction. Before talking to a sales person, you should arm yourself with some information about these 3 basic principals. Be prepared with some basic information about the size you need. An 8×10 would be the most common size by far. One size up would be 9×12 and one size down 6×9. These are typically really good sizes for most people’s rooms. An entry way often look best with a 4×6. Runners usually come in about 2-3 feet wide; by 8, 10 or 12 feet long; and those will fit most hallways. The best fiber for rugs by far is wool. Wool is the softest, strongest and most resilient fiber to walk on. A low-quality wool rug will outlast the best synthetic (nylon, acrylic, polyester, olefin) fiber by years. It is great at hiding dust and soil and cleans way better than other fibers. Wool also comes with a natural infusion of lanolin that coats every fiber and is the only true sustainable “green” choice if you care about the planet. All other “synthetic” options are made from petroleum by-products. Quality rugs are hand-woven, meaning that individual strands of dyed wool are tied to warp strands. These warp strands act as the “skeleton” of the rug and are what you see as fringes on the end. Knotting a rug obviously takes time and care. This will increase the price but rugs made in this way are meant to last a lifetime. Tufted rugs are trending in the United States. Instead of tying the wool strands to a framework, tufting involves punching it through a canvas backing and then securing it with liquid latex. The result is often a highly decorative looking rug on one side but with materials that quickly deteriorate and cannot be properly cleaned. Tufted rugs are to woven rugs what particle-board furniture is to real wood furniture. Ikea sells a lot of particle board furniture because it is inexpensive and reasonably good looking but no one is thinking of passing it down to their children because they know it will not last. The truth is, purchasing an Oriental area rug can and should be an enjoyable experience and ultimately, a wise investment. If looking at rugs makes you curious, here are some other great online resources including Hali Magazine , Rug Rag , and Emmit Eilands Rug Blog .